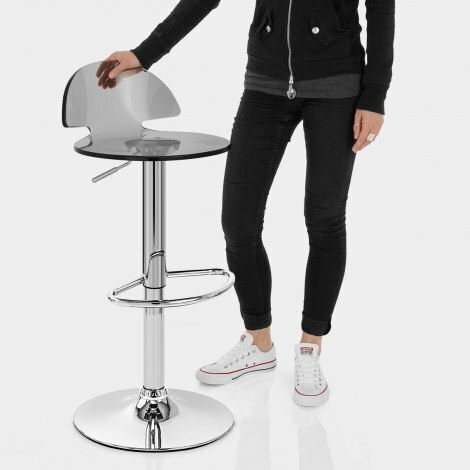 The superb contemporary Comet Bar Stool is a sleek design that incorporates sleek lines and a translucent smoked acrylic seat to create an item of furniture that gives lots of presence and always catches the eye. It exudes style and chic, and the simple uncluttered design mixes well with any type of decor. The round moulded seat is designed for high comfort and has a semicircular backrest that rises to give excellent support, making the Comet superbly comfortable. The futuristic design of the Comet stool means it is perfect for modern environments, like a new age kitchen or a minimalist breakfast bar. The Comet also comes with an adjustable height gas lift and 360 degree swivel mechanism, and has the use of an incorporated footrest. The whole stool stands on a sturdy circular base that has a rubber ring beneath to protect your floor. Very good for the price. Arrived promptly, easy to put together and look great in the kitchen. Not quite as comfortable as our old upholstered ones, but look much more contemporary. I ordered 2 bar stools. They were easy to assemble and look very attractive in situ. Really pleased with the product. Really good value for money. The stools look great and, for a relatively inexpensive item, feel sturdy.